Every artist needs supplies. 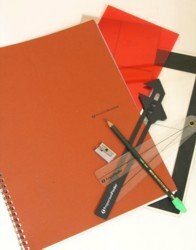 With the Drawing Portfolio you don't have to worry whether you've got the right materials because we've already thought of that for you. 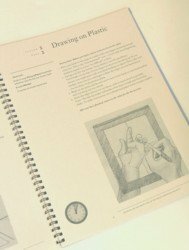 The contents of the Drawing Portfolio have been designed and put together by Dr Betty Edwards and Brian Bomeisler. Every participant on the Drawing on the Right Side of the Brain® 5-day course is given a portfolio and it is yours to take home and keep. Included too are some specific tools that were designed by Brian Bomeisler and are unique to Drawing on the Right Side of the Brain®. 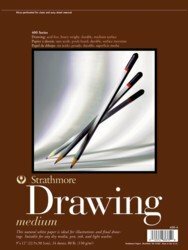 With a recommended retail price of over £55 (exc DVD), the Drawing Portfolio includes all the materials you will need to master the basic skill of realistic drawing. A 26-page booklet which includes a guide to each lesson and drawings to clarify each exercise. 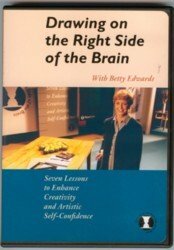 The Portfolio Booklet, published by Drawing on the Right Side of the Brain Inc., follows the format of the 5-day course. It gives you all the instructions and tips you need so when you're drawing back at home, you've always got them to hand if you need to refresh your memory. Strathmore drawing paper is very forgiving. It's easy to correct a line or change your mind without spoiling your drawing. Unfortunately it's not possible to buy this paper in the UK so I import it specially from the USA for the course. On Day 1 students do a pre-instruction drawing as a record of their skills at the start of the course. On Day 5 students do another self-portrait - this time using all the skills learned during the course. Seeing the two drawings side-by-side is a great way to see you how much you have learned in just five days. The red gel film placed over the mirror helps the student see shapes of light and shade more clearly. 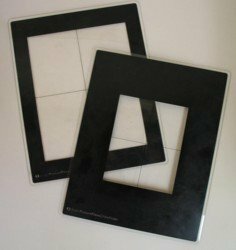 The viewfinder/picture plane comes in two sizes and is a unique tool devised by Brian Bomeisler. It is based on similar tools to those used by artists such as Durer and Van Gogh. It helps the beginning student with composition, seeing negative space and mastering difficult foreshortening in a subject. The angle finder is particularly helpful for the perspective drawings we do on Day 3. This tool is unique to Drawing on the Right Side of the Brain® and with the propertion finder, was also developed by Brian Bomeisler. Another unique tool, the proportion finder helps the beginning student check relationships so the finished drawing has the proportions intended from the start. The dvd is designed to be used in conjunction with tools and material covered in the 5-day course developed by Dr Edwards. It's a great refresher once you get home! You can purchase this 1hr 50 min dvd for £25 as an extra when you book a course with me and you will receive it along with your portfolio on the first day.